MyPublisher.com Photo Books Make Great Father's Day Gifts! From bear hugs, to building snowmen, to grilling at backyard barbecues, dads are responsible for some of the fondest life-long memories that we have. This Father's Day, wouldn't it be great to be able to capture those memories in a keepsake gift that will last for generations? MyPublisher.com, an online publishing company, allows you to customize your own book filled with snapshots of heart-warming memories paired with famous quotes from dad, all packaged in a photo book that can be personalized with materials, covers and colors, making the gift as unique as each dad. Not sure where to start? 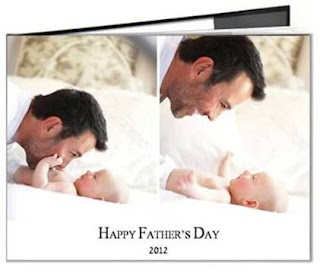 MyPublisher.com has 5 Quick Tips to Create the Perfect Photo Book for Dad which I've included below. 1.) Take a deep breath – This is about making something personal and thoughtful. The photo book will look great no matter how it turns out! 2.) Create a logical system for your photos – Rename your files with descriptive titles, so it is easier to find the ones you need. 3.) Keep it simple – It’s impossible to squeeze every photo you ever took with your dad into one book, consider using a theme to help you prioritize photos. 4.) Keep it real – Forget staged photos; sometimes the pictures that aren’t perfect are the most memorable. 5.) Customize it – Use MyPublisher to create a high quality, personalized photo book that will last generations. Let me tell you about my experience with MyPublisher! When I was ready and selected the photos I wanted to work with, I went to the MyPublisher website. After a quick down load of their free easy-to-use software, creating a gift for Father's Day, was very quick and fun to create. I loved that the easy-to-use software guided me every step of the way when I created my photo book. There are many layouts, and styles to choose from to personalize your photo book. I was thrilled that it checked my progress, and noticed that I had spelling errors in my captions, and reminded me that I had a blank page. Once I was ready to check out, the guided check out offered many options to enhance my photo book, such as a book sleeve, additional cover choices, many types of paper, and additional copies of my book. The step by step process, helped me to create my photo book in less than 30 minutes, and I was thrilled with how it turned out! MyPublisher.com stands behind their work, and has a 100% customer satisfaction guarantee. Thinking about what to get the special man in your life, for Father's Day? A gift from MyPublisher.com, would make lasting memories for many years to come! Father's Day is June 17th, are you ready to give dad the perfect gift? *Disclosure: This was a compensated review for MyPublisher.com, I was given product to review but all thoughts and opinions are 100% my own.